Definition at line 25 of file CLGradientStops.h. Definition at line 14 of file CLGradientStops.cpp. 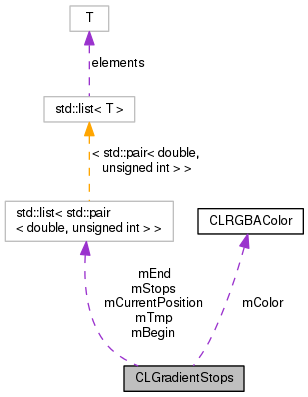 References CLGradientBase::getGradientStop(), CLGradientBase::getNumGradientStops(), CLGradientStop::getOffset(), CLRelAbsVector::getRelativeValue(), CLGradientStop::getStopColor(), mBegin, mColorData, mCurrentPosition, mEnd, mIndex, and mStops. Definition at line 89 of file CLGradientStops.cpp. This method takes the given offset value and adjust it if it is outside the rangr from 0.0 to 1.0 depending on the spread method that has been set from the gradient. Definition at line 179 of file CLGradientStops.cpp. References mSpreadMethod, CLGradientBase::PAD, CLGradientBase::REFLECT, and CLGradientBase::REPEAT. Definition at line 174 of file CLGradientStops.cpp. Referenced by CLLayoutRenderer::create_linear_gradient_texture(), and CLLayoutRenderer::create_radial_gradient_texture(). Given a relative value, this routine returns a const pointer to an rgba value that is 4 unsigned char long. If the gradient that was used to create the CLGradientStops object didn't have any gradient stops, the color that is returned is completly transparent black. Definition at line 104 of file CLGradientStops.cpp. References adjust_value(), CLRGBAColor::mA, CLRGBAColor::mB, mBegin, mColor, mColorData, mCurrentPosition, mEnd, CLRGBAColor::mG, mHelp, mIndex, CLRGBAColor::mR, and mTmp. Definition at line 38 of file CLGradientStops.h. Referenced by CLGradientStops(), and update_color(). Definition at line 48 of file CLGradientStops.h. Referenced by color(), and update_color(). Definition at line 31 of file CLGradientStops.h. Referenced by CLGradientStops(), update_color(), and ~CLGradientStops(). Definition at line 40 of file CLGradientStops.h. Definition at line 39 of file CLGradientStops.h. Definition at line 52 of file CLGradientStops.h. Definition at line 44 of file CLGradientStops.h. Definition at line 28 of file CLGradientStops.h. Definition at line 35 of file CLGradientStops.h. Definition at line 41 of file CLGradientStops.h.